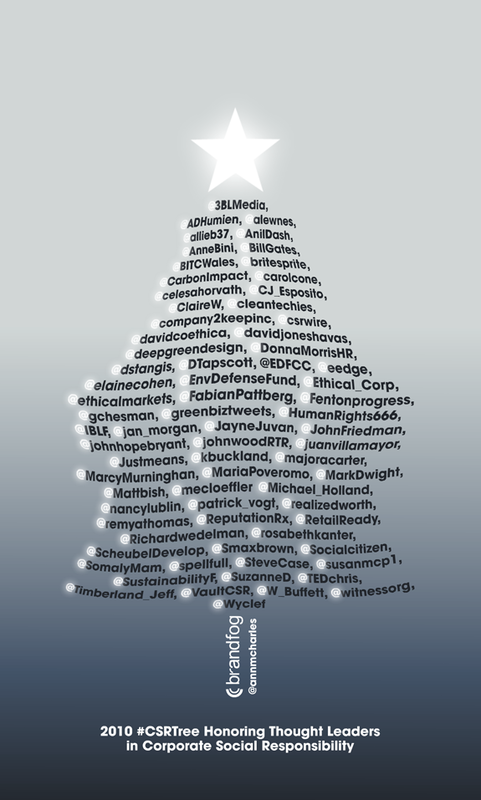 Today I feel in good company indeed: I feel proud that Fast Company has listed me as one of the ‘Best of CSR in 2010’ contributors on Twitter, in its 2010 CSR Christmas Tree. This is about being recognized as a ‘Thought Leader in CSR’. Seeing @ScheubelDevelop up there with @davidcoethica, @fabianpattberg, @elainecohen, @realizedworth – to name only a few of my much-admired peers – is a great motivation to keep going in 2011, with provocative thought and relevant information around CSR and sustainability, leadership and change.